Summary: The Clearwater Marine Aquarium (CMA) is seeking funding for the acquisition of a CO2 surgical laser unit. This laser unit would be used to remove and treat Fibropapilloma (FP) tumors in sea turtles admitted into rehabilitation at CMA. Currently, the Florida sea turtle network is in need of facilities to house and treat FP turtles, with the expectation of releasing turtles after rehabilitation without visible FP growth. 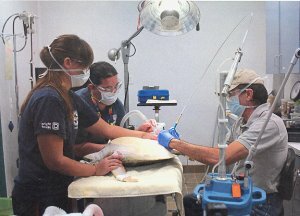 CMA is one of three facilities that have the willingness and ability to admit and rehabilitate sea turtles with clinical FP signs. To meet the need of turtles with FP tumors, a more proficient and aggressive mode of removal is necessary. Surgical laser units make for a more efficient surgery, with reduced hemorrhaging, quicker healing due to less inflammation and faster recovery time overall. Increased healing time with less chance of FP tumor re-growth makes for a more successful rehabilitation period and allows for the opportunity for release of sea turtles back into the local populations. Results: CMA is one of four facilities in Florida that is currently rehabilitating sea turtles with FP, or Fibropapillomatosis. FP is a disease process, found mostly in juvenile green sea turtles that manifests as cruciform tumors proliferating the soft tissues. These tumors can grow on the eyes, axillary and inguinal regions and can also be found on carapace and plastron areas. If tumors are found internally via CT (computed tomography) or radiographically, the prognosis is fatal, as it is usually inoperable. The Clearwater Marine Aquarium (CMA) sought financial support through the Sea Turtle License Plate Grant for the purchase of a single C02 laser system, with a corresponding smoke evacuation device. We were granted this request and purchased a package offered to us by LuxarCare. During the time we have owned this laser unit, we have been able to perform 9 surgeries on 7 juvenile green sea turtles with active FP. Out of these 7 sea turtles, 4 have been released and 2 are still in rehabilitation at CMA. Without this important piece of medical equipment, CMA would have no hope in attempting to rehabilitate these green sea turtles afflicted with FP.